Radioactive waste is, fundamentally, the lethal byproducts of the nuclear age. 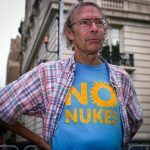 95% of all the radioactivity created in the U.S, from all sources including nuclear weapons production, is contained in the irradiated fuel—or high-level radioactive waste—from commercial nuclear power reactors. Yet even “low-level” nuclear waste can contain lethally-radioactive and long-lived elements, such as Plutonium-239, Strontium-90 and many others. Industry and government proposals to deregulate and “recycle” some “low-level” waste would allow it to be disposed of as normal garbage and enter the consumer marketplace—increasing radiation exposures to everyone. The storage—permanent and temporary–and transport of radioactive waste is perhaps the most controversial aspect of the nuclear power issue. No nation has yet solved the problem of what to do with this material, which must be shielded from the environment for millennia. In this section, you’ll find basic information on radioactive waste and current issues surrounding this material. And watch for Alerts that will provide ways you can help implement policies that will serve to reach the goal of isolating dangerous radioactive waste from the environment for its full hazardous life. Click on the links in the box to the left for more information on the wide array of radioactive waste issues: from high-level to “low-level,” from onsite storage to waste transport and more.